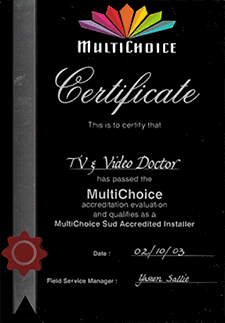 Accredited DStv Installers in the Pretoria, Moot & Centurion areas - Professional & Dependable - Since 1986. MultiChoice offers digital media content - anywhere, anytime. Television . Mobile . Computer . However, it is the video and audio channels that we are focused on with a DStv installation. This mainly means that you have your entertainment sorted out - and the delivery of quality signal to your decoder is our concern. 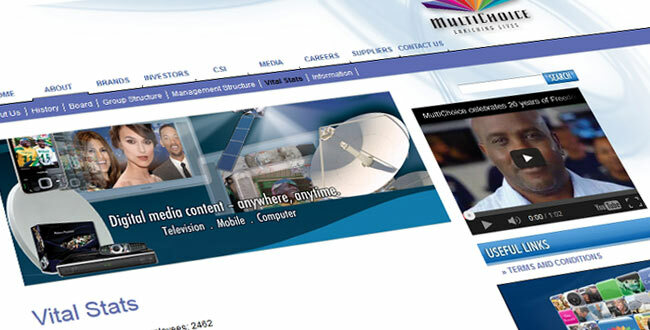 MultiChoice is made up of top brands, with DStv, M-Net, Super Sport and Mweb as their leading brands. MultiChoice has terrestrial analogue and digital direct-to-home satellite television platforms. The existing analogue system has been around for over 20 years, delivering the main M-Net entertainment channel and Community Services Network (CSN). The analogue system uses 72 transmitter sites to deliver content exclusively to South Africa. Via their three different satellite broadcasting platforms, MultiChoice imports channels from all over the world. These are packaged with local channels originating in the countries in which we operate, to form compelling entertainment bouquets for subscribers. Working with a network of about 780 MultiChoice Accredited DStv Installers, Multichoice is committed to making DSTV viewing as pleasurable as possible for their customers. MultiChoice maintains an ongoing relationship with its Accredited DStv Installers and ensures DStv installations are done to Multichoice standards. MultiChoice strongly advises its customer to only use Accredited DStv Installers so that the quality of workmanship is guaranteed. Contractual obligations also ensure that Accredited DStv Installers provide an efficient and satisfactory service. Apart from knowing that you have recourse - with MultiChoice themselves, you have peace-of-mind that your installation has been done to the highest standards, is correctly costed, has been installed by experienced (the best DStv installers) who have the right testing equipment, install the correct products and give the correct advice. Peace of mind that you have professionals working on your installation, who have committed themselves to delivering the best service available, to ensuring that you get value for your money and experience customer satisfaction throughout the installation. Know, that when your DStv has been installed, there will be no "after-installation hassles". We will call you a few days after the installation has been done and do a small survey, to get some feedback on our service, professionalism, and to know that your new system is working perfectly. "Accredited & Dependable DStv Installers - done right, the first time!